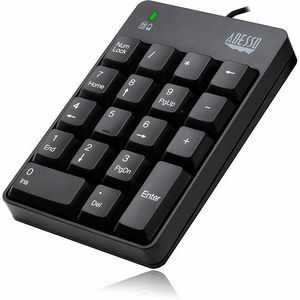 The AKB-601UB only weighs a quarter of a pound and is less than three and a half inches wide which makes it extremely portable and space saving. The keypad's spill resistant design helps to prevent fluids from staying inside, which would otherwise cause damage to the keypad. Membrane key switches provide a quieter typing experience with lifecycle lasting up to five million keystrokes. The AKB-601UB requires no driver. Simply connect the device to your computer and begin enjoying your new peripheral companion.